(a) Meeting Imam Mahdi (a.s) without realizing that he is Imam and there are scores of incidents in this regard. 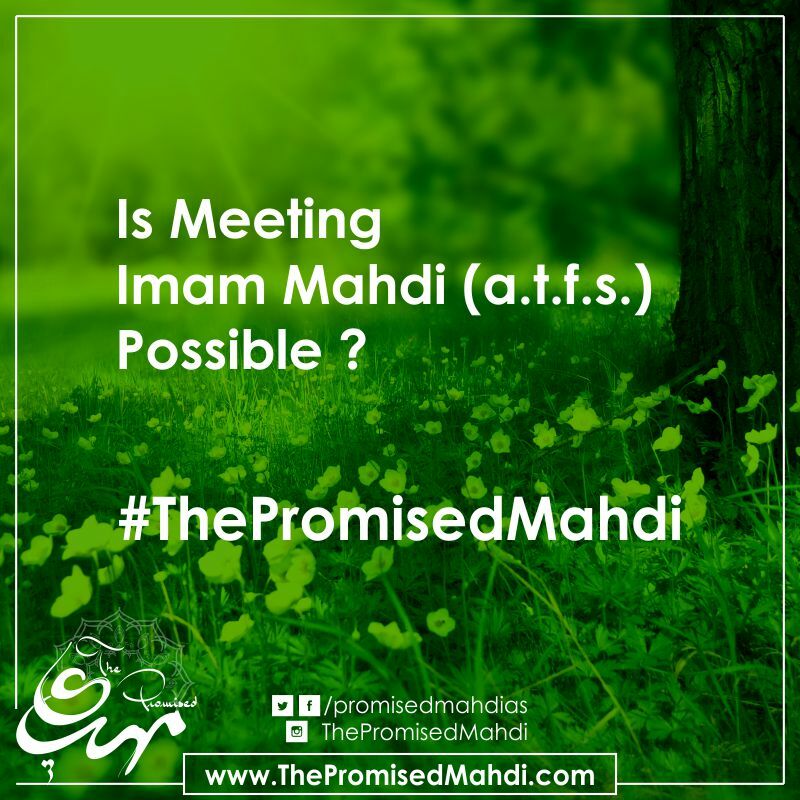 (b) Meeting Imam Mahdi (a.s) but becoming aware afterwards. (c) To meet Imam and during conversation realize that he is talking with Imam. These types of incidents are very few; may be due to complete occulta­tion this thing is kept secret. 1) Muhaddis-e-Qummi in book Muntahal Aamaal narrates an incident from Mulla Zainul Aabedin Salmasi about Allamah Bahrul Uloom. Incident pertains to those days when Allamah was staying in Mecca and giving lectures to Hanafi, Shafaee, Malekei and Hanbali scholars. Salmasi says that one day he expressed concern about the mounting expenses due to Allamah’s benevolence and the situation had arrived when not a single penny was left. Yet Salmasi did not receive any reply. The routine schedule of Allamah consisted of him performing the circumambulation of Kaaba, then going in a private chamber and after smoking pipe going into another chamber where he used to give instructions and verdicts in various schools of jurisprudence. Next day when he just started smoking somebody knocked at the door and to my astonishment Allamah himself quickly rushed to open the door instructing me to take the pipe away. I saw a handsome man in the dress of Arabs, with a pleasing personality who entered and sat in the room and Allamah in utter humbleness sat by the side of door and indicated me not to bring the pipe. After conversing for some time the man stood up and Allamah himself opened the door and made him ride the camel. Later Allamah returned and seemed perplexed. He gave me a piece of paper and asked me to go to a money changer who was stationed at the hill of Safa and to take whatever he gave. I went there and handed over that note to him. He with great respect kissed it and asked me to bring four laborers. I did so and they were loaded with riyals to the extent they could carry. Once I went to Safa to inquire about that money changer but to my astonishment I did not find a single shop there. I inquired in the vicinity but they also asserted that they had never seen any money­changer there. I understood that it is a secret of Allah. 2) Mention in this regard can be made of another incident of Allamah Bahrul Uloom which is reported by Allama Majlisi (r.a.). Aqa-e-Zainul Aabedin Salmasi narrates that he was sitting in gathering of Allamah Bahrul Uloom and at that time one per­son questioned him about the possibility of meeting Imam Mahdi (a.s.) Allamah, who was holding a smoking pipe in his hand, put aside the pipe and bending his head murmured in such a manner that I was able to hear it. He said, “What reply I should give to this person? Although, Imam Mahdi (a.s.) has embraced me there are explicit traditions calling a person liar who claims to have met him” After this he lifted his head and replied, “It is narrated in the traditions that one who claims to have met Imam should be outrightly rejected.” Allamah did not say a single word further. From the above incidents it becomes clear that meeting Hazrat is possible but propagating it is not permitted, so as to prevent its misuse by self-cen­tered people. about it. Then the person pronounced thrice (in nomadic language) which meant, ‘I advise you concerning your father’ and disappeared. Then he (barber) realized that the man was no other than Hazrat Hujjat (a.s.) who is not happy to see me remain negli­gent of my father even on Wednesdays. 4) Aqa-e-Haj Reza Hamdani narrates in his book ‘Misbah’ that on some occasions Hazrat Hujjat (a.s.) gives opportunity of seeing him to his selected and trustworthy Shias. For instance, about fifty years back a pious scholar Abdur Rahim Dimavandi was able to avail of this opportunity. He narrates that in a complete darkness he met Hazrat, who was standing facing Qibla and light was emitting from his face. The light was so luminating that even the floor was clearly visible along with its details. In short, after considering the numerous incidents of meeting Hazrat and also the traditions we can conclude that, It is absolutely absurd and false to claim that meeting with Hazrat can be held at ones desire, without the same from Imam. on other hand, if Hazrat himself wishes to honor somebody with the opportunity to meet him is a different matter.